For Thanksgiving your table needs to be a thing to behold. Sure the food should be tasty, but when people Instagram those pictures followers will see your centerpiece not taste your turkey. I’m sadly not entirely joking. Thanksgiving is one of those holidays where majority of the time is spent sitting around a table enjoying the company of others, eating and taking in the table scenery. Give them something to look at and something to discuss. 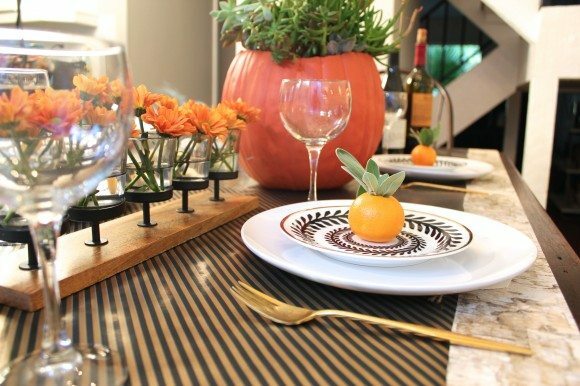 Here are 5 different options for hosting and decorating for Thanksgiving. Recently I shot a segment with local Austin Time Warner Cable News. House Proud host Amy Hadley and I had ourselves a Friendsgiving. Friendsgiving is for all your friends who are ‘orphaned’ at Thanksgiving and have nowhere to go. We discussed many added bonuses to hosting a Friendsgiving. If you don’t know the proper way to set the table it’s ok because your friends probably don’t either. Instead wow your friends with other aspects on your table like easy to make clementine and sage accents, decorative wrapping paper as a table runner and plenty of fresh flowers. TIP: Friendsgiving is an event for ‘orphans’. All those other friends that are saving their plane ticket money for December. Enlist those friends to help and make this event potluck style. Oranges, browns and mustard yellows are as obvious on a Thanksgiving table as a turkey. 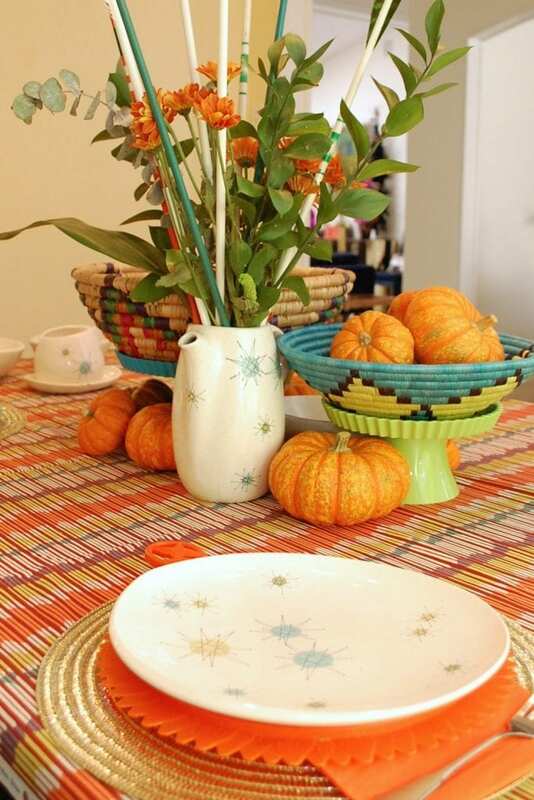 A gorgeous tablecloth, some small pumpkins and maybe a couple of festive Thanksgiving figurines and your table is set. Pop over to the Tuesday Morning blog to see all my tips for setting this table. TIP: Get crafty when setting your table. The small flags in the pumpkins added a little something extra special to the table with very little work. These flags were part of my part of my scrapbook stash, but look perfect on my Thanksgiving table. Think turkeys, pilgrims and pumpkins with this look. Any symbolic figurine would work if you don’t happen to have a real taxidermy turkey on hand like my mother. Festive Thanksgiving props are easily found at most big box stores and even some thrift stores if you get lucky. TIP: Though this centerpiece is spectacular, it is big. Really big. Really big equals great impact, but the turkey also acts as a barrier for conversation for those sitting on opposite sides of this feathered fella. The nice thing about going eclectic with your table is that there is no right or wrong way to do it. Use mix matched chairs, fabric for tablecloths, tribal baskets full or pumpkins, bouquets of arrows and more. With the eclectic look it is completely acceptable to mix 50’s dishes, paper napkins and retro plastic plate chargers. TIP: Up the funk factor if you go this route. A few mix-matched items will look out of place. To pull this look together it is all or nothing. Make the juxtaposition as obvious as your turkey is juicy. 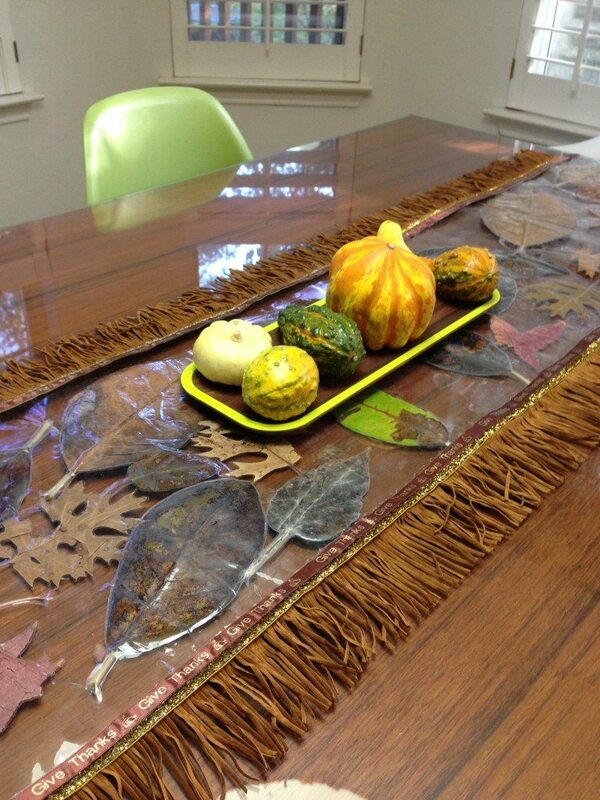 My favorite craft project as of late is this table runner I made by laminating fall leaves for I Love to Create. Check out the full DIY on their blog. Some of these leaves are from my own yard and others were brought back from a fall trip to Ohio. The lamination protects the leaves from cracking. Lamination makes for easy clean-up and when you are finished just roll into a loose tube and save for next year. TIP: If you live in an urban jungle with no nature to be found, try visiting your local craft store. Most have a section with all kinds of fall foliage real and fake. So what kind of Thanksgiving table are you going to set? Posted November 24, 2014 & filed under Holidays, Thanksgiving. Hey candice thank you for stopping by. Mixy-matchy is always the best!